This is such a beautiful and serene pic! Love Cinque Terre! Great photo! I’d recognize that Cinque Terre water anywhere! Beautiful – a very special blue, isn’t it? 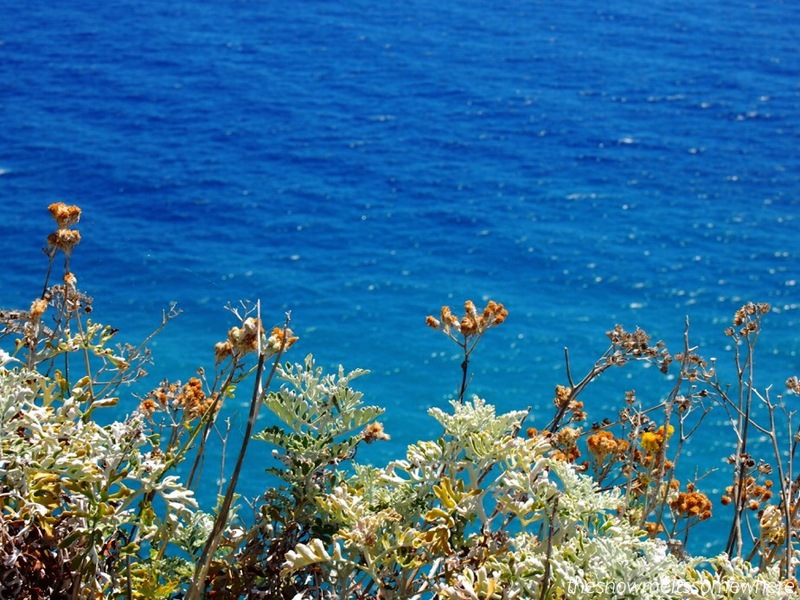 Wow – wonderful blue – and the foreground nature only makes the blue come alive even more…. There are so many interesting places to see in Italy… and the food..! I think you’ll like it! How low did you go? I hope not all the way to Pisa. That’s already my territory! We just went to Cinque Terre, Corniglia was the lowest point. The flights arrived in Milan, spent a short while there, too. Yes, there are other posts coming, I took like 5 million photos! 😜 Just haven’t had time to write anything yet. This was my first time there. It was more touristy than I expected – I thought there would be lots of locals coz it was a Sunday, but in fact it was full of foreigners (like me – I’m not judging, just saying!). And I didn’t see the iconic houses on hills… and it was too hot to hike the trails. But I got some colorful pictures, visited 3 of the towns and had a fun day with my friend! Sounds most excellent, glad for you and looking forward to seeing more photos! Thanks, I adore that color! No, we didn’t have time, just one day! Next time! I just looked it up. Now I’ll have to put that area on my list! Just coming back from Marseille, I couldn’t agree more! Totally magnificent! I can feel it all in body and soul! Cinque Terre is yet another Italian spot I need to discover; every time I see pictures of it, I wish I could fly there immediately! Thanks, Inger! Happy to see you here again! That depth of the blue and the warmth of the sun and the beauty of wild flowers- what a winning combination! Loved it! Thanks! To me, this photo represents the Mediterranean so well. I love visiting it whenever I can, whichever country, I just love the whole region!